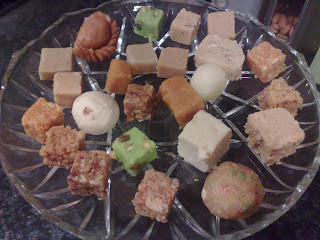 Happy Muslim Mama: Eid ul Adha 1431: Bangles and Sprinkles. Alhamdulillah, this Eid really was about the kids. We had two lots around whose parents were on hajj. 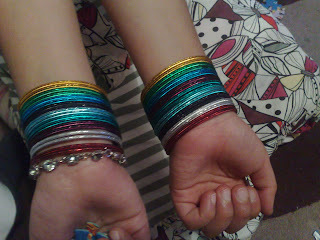 The girls wore maxi dresses and rainbow bangles which we took them out to pick the night before. The boys wore white thobes over jeans (it was freezing yesterday - literally, I woke up to find the bins in my front garden covered in ice). No one stayed still long enough for me take reasonable pics. Little Lady ganged up with my little cousin and the two dissappeared into my room for most of the day. 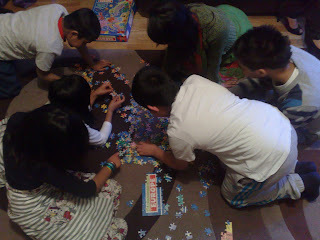 That puzzle finally came in handy to keep the kids occuppied with my sisters also joining in. I accumulated a serious sweet stash, including three boxes of Indian Sweets (I got another after I took this pic). Kooky Little Sister brought the Krispey Kreme donuts much to everyone's excitement - okay maybe especially mine. I managed three cream-filled numbers vefore I decided to have some shame and offer them round. Of course a fight broke out over the single one that had rainbow sprinkles. 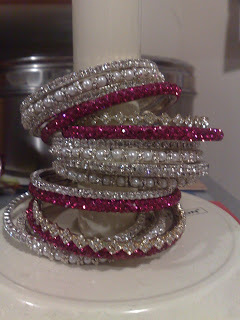 I had pretty bangles to wear, but they spent most of the day on the kitchen roll holder whilst I cooked or had my hands in the sink. I also did my make-up (as I was home) which I rarely get to do, then had to wash it off to make wudhu (always happens when I get it right for a change). It was a busy but lovely day. 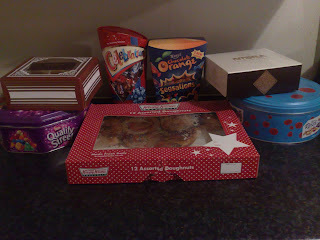 The kids were happy, I confiscated any Eid-money over £5 so managed to take some loot, everyone was well fed (in about four or five shifts throughout the day as people came and went. Best of all was having my parents and sisters around for dinner. My sisters kindly washed the dishes for me in the evening (I should have taken a picture of the humungous pile) and helped clear the kitchen. I can tell you, I was happy but thoroughly exhausted and fell asleep whilst the kids were still up. The kids have to go school today, but I will get dressed up and go to my mum's straight after. I will be heading over this morning to help her out and to swap Eid gifts with my sisters insh'Allah (their masjid is celebrating today), eat my mum's comfort food and put my feet up. Lol re: your Graphic description of stuffing the Krispy Kremes. They are seriously addictive. I could do with the Quality Streets Toffees. Always pleases me when you show pics of your Pretty bangles. Here in SA it was an overcast grey day.You'd be forgiven if you thought it was ye 'ole England. Been Raining on and off. Supposed to be the height of Summer. Ah well. Oops forgot to add: You deserve to put up your feet and enjoy the day at Mum's place. Salam Aleikum dear sister and I am happy you and your family had such a nice Eid! I hope this next year brings you and your loved ones good health, happiness, and prosperity! A belated Eid Mubarak!! Ahhh 2 of my favorite things bangles and sweets!